Lambda Double Pitch Chain uses special oil-impregnated bushes to provide lube-free, long life operation to meet a wide variety of customer needs. Helps users reduce overall costs in their applications. 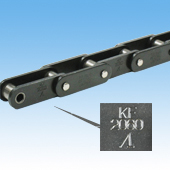 Tsubaki also offers surface treated Lambda Double Pitch Chain, which is tough against corrosion, and KF Series chain for use in high temperature environments and food equipment. 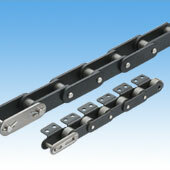 Interchangeable with standard Double Pitch Chain. Due to the compliant lubrication to NSF-H1 as special contained bush , it also can be used on food machinery. Note) Please be aware that NSF-H1 non-compliant rust prevention oil and oils for building are also attached in the process of manufacturing. The structural diagram shows an RS Attachment Chain. NFS is the only organization in the world that verifies the hygienic quality of food lubrication. NSF-H1 is the standard regulated by NSF. This is "Lubricant ingredients are safe in the event of incidental food contact." oil. 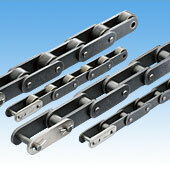 A Double Pitch Chain in Lambda specifications using special oil-impregnated bushes for lube-free, long life operation. A Lambda Double Pitch Chain coated with a surface treatment for better corrosion resistance. We offer NP and NEP Series to meet your corrosion resistance needs. Usable in a wide range of temperatures, from ambient temperature to 230°C. 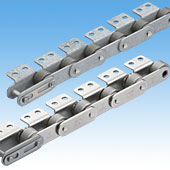 This eco-friendly lube-free Double Pitch Chain can be used for food conveyance as well.